The two tribes walk into what they assume will be a challenge, but it's actually the merge! This means it's the time of the season for shizz to go off the rails, but first: a feast. While tearing into bread, cheese, and other deliciousness, details are spilled on Joaquin. Carolyn listens to the story and realizes a common theme this season is to eliminate power couples, and her half of the power couple knows she has a hidden immunity idol. With stomachs full of cheese and rum, the tribe heads to their new home on Escameca beach and the shelter is gone. Haha suckers, time to build again! After avoiding the temptation to pee on Dan's jellyfish sting, the team decides on their new name. Normally it's a boring mashup of the two former tribe names. 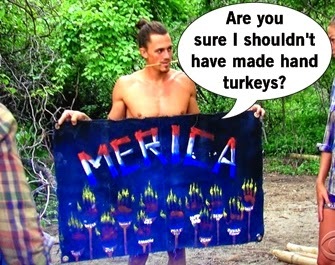 This season they decide to take a step towards truly terrible with Merica. Not an ironic 'Murica, but simple America minus the A. Red, white, and blue and a bunch of diverse people from across the country. Shirin seems to be the only one who feels our pain. Meanwhile, can't get the America's Funniest Videos theme song out of my head. Usually people are on the sly about making alliances, but it's very forward this time and everyone begins to scatter and scheme. Reunited with again with her old tribe, Kelly and Mike are plan to run the game with the former Blue Collars plus two more for the numbers. Oh hello, Will and the two White Collars. Those same three players are in demand by Jenn and Hali, who never trusted Kelly and would like to wipe out the Blue Collar crew. Rodney starts his loud ways of wheelin' and dealin', offering Will and Carolyn a final four deal. Meanwhile, Carolyn and Tyler are happy to be in demand, but agreed they have to keep their bond a secret to avoid the fate of the other power couples. But Rodney's haggling might be too early, because Mike wants to target Will first should they lose. The first solo Immunity Challenge is a classic foot, arm, and crotch killer: holding on a pole for dear life. In no surprise ever, Dan and Will drop quickly, bellies rubbing up against that pole. Others follow rather quickly because, as Jeff Probst reminds the viewers repeatedly, this is a challenge for small people. The final four up on the pole are Carolyn, Joe, Hali, and Jenn (who got stung by a bug in the lady area). Soon the rain starts pouring down, probably the hardest we've seen this season so far. After a final two hang-on between, Joe and Carolyn, Joe wins the first individual immunity. Rodney shakes his head in repulsion. It's the same face I make when he talks. Blue Collar (ok, just Mike) lament Joe's victory but quickly turns the target on Joe's allies, Jenn or Hali. The plan is for them to vote off Jenn, but tell Will to vote for Hali to see if he's trustworthy. To really get the numbers on their side, Kelly works to bring Carolyn over, while Mike tries to work with Tyler. Tyler is hesistant since he was blindsided by the whole Joaquin thing, so either he's fully in on the plans or he's a no go. The other White Collar remaining, Shirin, pledges her loyalty to the No Collars and plan to vote out Kelly. So many targets and alliances, my head hurts. Tyler and Carolyn have a secret chat together about the plans on both sides, discussing their spots as the swing votes that will determine everything. Sensing that they could totally be on the outs, Jenn wonders if tonight's the night to play that idol of hers. Hali asks how Jenn found the idol. "Magic," she says. Jenn plans to bring the hidden immunity idol to Tribal Council and play it if anything shady goes down. Tribal Council time! Will says that everyone is a target, so much so that even Probst could be voted out (please tell me this happens on a blooper reel). The game is already super cutthroat with everyone playing to win. Tyler and Carolyn agree that this vote will draw a line in the sand and truly create separate sides. Probst brings up that no hidden immunity idols have been played, which is of course a lot foreshadowing action. And with Dan's final metaphor of the line being drawn with a chainsaw, because everything is like stabby horror movie metaphors with this group. 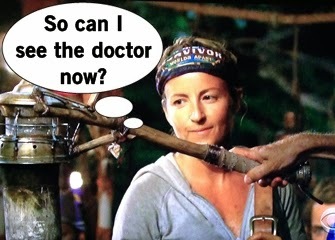 After the votes are cast, Jenn decides to make her power move and play her hidden immunity idol like a GD boss. Once the votes role in for Jenn, her and the No Collars snicker and lightly cheer. So it's Kelly who is voted out of the game. She could probably use that doctor's visit now.